Our financial assistance program helps qualified customers access emergency services and medically necessary care when they need help paying for these services. North Memorial Health’s financial assistance policy provides financial assistance (charity care) to low-income, uninsured, or underinsured individuals who need help paying for all or part of their medical care. NMH customers are eligible for NMH financial assistance when their Family Income is at or below 275% of the Federal Poverty Level (FPL) income guidelines. All Policy Requirements outlined below. Customers who are eligible for NMH financial assistance will not be charged more than Amounts Generally Billed (AGB) by NMH for emergency or other medically necessary care to customers with insurance (AGB, as defined by IRS Section 501(r)). You may be eligible for a 100% discount if your Family Income is at or below 200% of the Federal Poverty Level income guidelines. You may be eligible for an Amounts Generally Billed (AGB) discount if your Family Income is at or below 275% of the Federal Poverty Level income guidelines. If your verified Family Income is at or below 275% of the Federal Poverty Level and your medical bills exceed 25% of your Family Income you may also apply for a catastrophic care discount. This program is limited to one episode of care, which includes subsequent treatment or services related to that same episode of care, or a series of ongoing medically necessary services intended to treat a specific diagnosis. 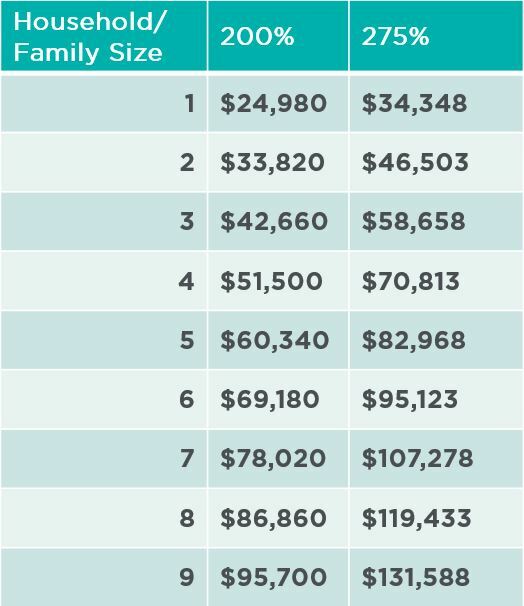 Customers whose Family Income is at or below 200% of the FPL with Liquid Assets that exceed $20,000. will be eligible for 100% discount under this policy provided the customer provides payment to NMH to reduce their Liquid Assets to $20,000. The amount paid by the NMH customer will not exceed the Amounts Generally Billed. The customer may receive the AGB discount if they choose not to provide payment to NMH and reduce their Liquid Assets to $20,000. Customers who are provided emergency medical and medically necessary services by NMH are required to have a claim submitted to the insurance carrier for payment or denial of payment prior to determining the amount eligible for a charity care discount. Customer responsibility after insurance payments will not exceed the Amounts Generally Billed. NMH participates in Senior Partners Care. For this program, NMH partners with Senior Community Services to waive clinic co-insurance and deductibles for customers who are members of Senior Partners Care. Eligibility for this program is determined by Senior Community Partners. NMH also offers an Uninsured Discount to customers who are not eligible for financial assistance and whose annual income is less than $125,000. If you need additional information on NMH’s uninsured discount please call 763-581-4980, or 866-358-2644. North Memorial Health Ambulance, 4501 68th Avenue North, Brooklyn Center, MN 55429. We will promptly review submitted applications with supporting documentation and notify you of financial assistance eligibility in writing within 30 days of receipt of a complete application. We will not consider incomplete applications, but will notify applicants by phone or mail of an incomplete application and provide you an opportunity to send in the missing documentation or information within 30 days from the date of notification. NMH’s Financial Assistance Policy applies to emergency and medically necessary services provided by NMH hospital and clinic facilities within the NMH system, including both facility and professional services offered by North Memorial Health Hospital and Maple Grove Hospital, NMH hospice services, and NMH emergency transportation services. Refer to NMH’s Financial Assistance Policy for additional information on covered and non-covered services. Call 763-581-4980 or 866-358-2644 and ask to speak to a North Memorial Health financial counselor.